They still bear fruit in old age (Psalm 92:14). [imageframe lightbox=”no” gallery_id=”” lightbox_image=”” style_type=”bottomshadow” hover_type=”none” bordercolor=”” bordersize=”0px” borderradius=”0″ stylecolor=”” align=”right” link=”” linktarget=”_self” animation_type=”0″ animation_direction=”down” animation_speed=”0.1″ animation_offset=”” class=”” id=””] [/imageframe]Just a few days ago, I got to visit 98-year-old gospel preacher George Bailey, who resides in a “retirement home” in the greater Houston metropolitan area. What an incredible man! What remarkable grace and characteristic kindness – even at nearly the age of 100. 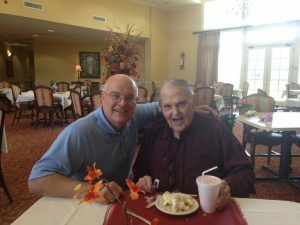 George Bailey quite likely has spoken in more Gospel Meetings than any living man in churches of Christ, yet he remains the epitome of a humble, caring Christian gentleman. In our wonderful time together, I couldn’t help but think, “How will I grow old?” Friend, How will you grow old? Perhaps there are a number of things over which we have no control as it concerns the aging process, but will others think of you and me as people of grace, kindness, humility and faithfulness? Like our beloved brother George Bailey, will we be able to see the grace of God over a lifetime of faithfulness? Will our lives have revolved around a lifetime of service to the body of Christ and concern for the lost and hurting? Will we, like George Bailey, be recognized for being tremendous encouragers throughout our lifetimes? Will our lives have been devoted to internalizing and to proclaiming God’s precious word? During a relatively brief visit, brother Bailey twice asked us to pray with him. When we grow old, will we be known for a lifetime of precious communion with God in prayer? Will we still long to pray, and to pray with / for others? When you and I grow old, will our love and joy in Christ still be evident in our eyes, our words, in our very core? I first heard George Bailey preach some 40 years ago. I can truly say he has been one of the finest preachers of Christ I’ve ever heard. Not once do I recall being disappointed in hearing him preach. He was always well prepared, eloquent, Bible filled and God-centered in his approach. But it hasn’t just been his manner as a preacher; it’s far more than that. George Bailey is first and foremost a man of God. And just a few days ago, I figured out that George Bailey – a master preacher by most anyone’s reckoning, and surely our Lord’s, had saved his very best sermon for his final years. Preacher friend and/or precious Christian – May God give us the grace to preach our very best sermon as brother Bailey is – by the way we live our lives to the very end. So glad you and Carl could make that visit. Brother Bailey is a treasure! Sorry for the delay in responding, Neal.